Allama Raja Nasir Abbas of MWM, Sahib Zada Hamid Raza of SIC and Faisal Raza Abidi were leading the convention while representatives of the all minorities were also Invited and were Present to attend the convention in order to condemn the terrorist activities by Taliban and Pro-Taliban banned terrorist organization. The Organizer and participants of the convention showed Practically that the Pakistani Nation is United and there is no Sectarianism or Religious Hatred among the Peace Loving Citizens of Pakistan ,As the Representative of the Martyrs , who laid down their Lives in the Defence of Pakistan also attended the Conference, and all the Speakers & Leaders who attended the Convention , vehemently argued on One Point agenda that the Pakistani nation is United against the Foreign Infested Terrorism In Pakistan and their Local Handler and executioners. Addressing the gathering, Chairman Sunni Ittehad Council (SIC) Sahibzada Hamid Raza said that the talks with Taliban were not acceptable as the TTP terrorist are traitors of Pakistan, and there should Be no Negotiations as it is against the Constitution of Pakistan. Sahibzada Hamid Raza, opined that the terrorists are neither Pakistanis nor Muslims and He count them as Savage Beast , and traitors of the country. He alleged that banned organizations are freely conducting meetings and conventions in the country; however, patriotic organizations are not allowed to do so. Allama Amin Shaheedi, leader of the MWM, said in his address that the NPC has been held to promote reconciliation and and remove the Mis understanding which are being created and being regularly publicized by the Negative Propaganda of the TTP and their allied Groups and Individuals , which may Be Politicians or Main Stream Journalist , who are on the Pay Roll of the Foreign Powers , trying to create Disharmony and Chaos in the country. He said that they would prove on January 12 that the whole nation is united against terrorism. Majlis-e-Wahdat-ul-Muslimeen (MWM) chief Allama Nasir Abbas said that the Taliban should be dealt with iron hands instead of giving Protection to them in shape of holding talks with them. Raja Nasir Abbas said in his address on the occasion that the enemies are trying to divide people of the country to Create a favorable condition to Disintegrate the Country. And He also added that Shia’s and Sunnis would jointly observe Eid Milad-un-Nabi (PBUH) to demonstrate mutual respect for both the sects among the Pakistani People and to show the Unity among all the Muslims. Sunni Ittehad Council and Majlis-e-Wahdat-ul-Muslimeen also announced to form patriot alliance. They asked the government to differentiate between patriot and traitor and operation should be started against terrorists instead of holding dialogue with Taliban. Senator Faisal Raza Abidi commented in his speech that the decision of dialogues was not made under the law and Constitution Of Pakistan but He added that he opposed such acts and He is ready to render any sacrifice for saving the country. They vowed to save country from terrorists and said that rulers could not stop them. Representatives of Sunni and Shia sects announced to hold big procession in Karachi on January 12. Deputy Secretary MWM, Allama Amin Shaheedi, Deputy Secretary SIC Tariq Mehboob, chairman All Hindu Alliance Movement Haroon Sarbadyal, Sardar Chirat Jeet Singh of Sikh community, Sheikh Salah-ud-Din, Pir Atiq-ur-Rehman and Sadia Raye were also Present there , to represent their respective communities and also addressed the gathering. The convention was held in D-Chowk opposite National Assembly as PML – N , which favours Negotiations with the Terrorist TTP , was against the National Unity Convention and thus , did not allow holding National Unity convention in convention centre. 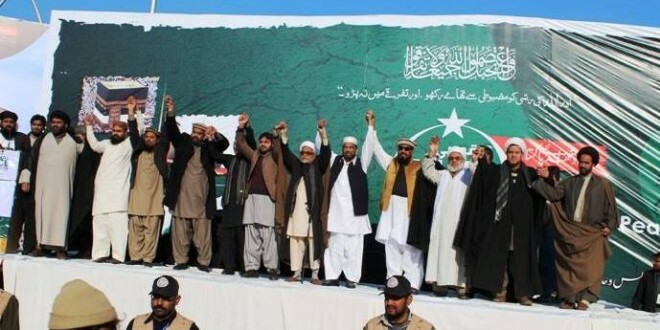 It should also be noted here that The banned Tehreek e Taliban Partners and their partners like ASWJ and LeJ have killed thousands of innocent Pakistani citizens , including the Persons of the Armed forces , across the country. And instead of Punishing the terrorist the Present Pakistani Government Led By PML – N ,Prime Minister Nawaz Sharif have given assignment to Maulana Samiul Haq to initiate talks with the Taliban. Maulana Sami who Publicly claims himself as Spritual Father of Taliban , Who is absolutely not in favour of Punishing the Terrorist , while instead is trying to facilitate the Terrorist TTP , and their allied Groups and Individuals as He has asked the Government to accept the demands of the TTP, with out even asking TTP to disarm ,who are the Major Perpetrators of the Terrorism against the Pakistani Nation and have even several times not only challenged the Armed forces , but have even Killed them savagely , and have even claimed the responsibility of such Henious acts , and now surrendering to the demands of such traitors of Pakistan ,will not be only against the Constitution of Pakistan , but that will be even High treason against the Nation. This entry was posted in Asia Pacific, Jafria, Pakistan News and tagged Allama Raja Nasir Abbas Jafari, Christian, Faisal Raza Abidi, Hindu, Itehaad, MWM, pakistan, shia, Sikh, Sunni, Sunni Ittehad Council, Unity. Bookmark the permalink.